Put a bunch of really old pieces of metal in a classroom and what do you get? Ancient Coin Museums!! 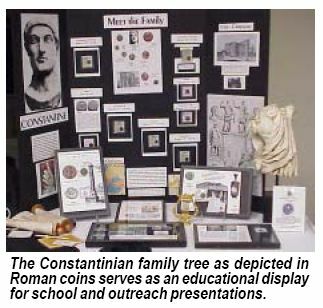 This is how the 1st ACE Ancient Coin Museum was pioneered by teacher Zee Ann Poerio at St Louise de Marillac school in Pittsburgh, PA. The enthusiasm for coins, inspired by third grade teacher Zee, was cemented by young Mia who earned a certificate from ACE for being the first and youngest student to identify her coin. When the idea of creating a school Ancient Coin Museum at St. Louise de Marillac School was introduced, all the students wanted to be involved to such an extent that the job of docent for a popular large Gordian III bronze showing Moesia flanked by a lion and a bull, both legionary emblems, has to be shared by a group of students working in shifts! The school's open house in February was a trial run for the Museum, and parents examined the displays, amazed to see exhibits like the story of Alexander the Great and his followers told through coins. Many remarked that they wished that they had had such opportunities in their younger days, and that the ancient coins made history come alive for them in a totally new way.